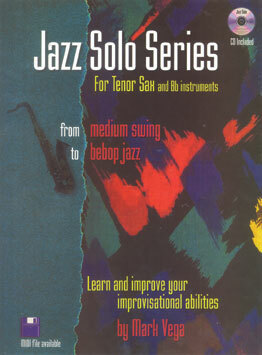 A great instructional tool for musicians and music students to learn or improve their improvisational abilities in the jazz - swing idiom. There are 66 examples in the book, starting at a somewhat easy level and gradually increasing in difficulty throughout the book. The book is divided into four sections: Section one, tracks 1 through 36 cover all twelve keys using 11-V-1 and 11-V-111-V1-11-V-1 chord progressions. Section two, tracks 37 through 60 cover all twelve keys using 1-V1-11-V-111-b111-11-V-1 chord progressions. Section three, tracks 61 through 66 are complete worked out solos over the chord changes to the popular Jazz standards “Stella By Starlight”, “Take the A Train” and “There Will Never Be Another You.” There are two solos for each of these three examples, an easy version followed by a more difficult one. The first version being a prime example of how to approach medium swing Jazz and the second version covering the more complex and demanding style of Bebop Jazz with its faster tempos and more difficult melodic and harmonic note choices. Section four, tracks 67, 68 and 69 are repeated choruses of the chord progressions to the above mentioned songs for extended practice.